Sun protection and skin cancer prevention ideally includes the regular use of sunscreen. Make sure your sunscreen is broad spectrum (blocks UVA and UVB rays), SPF 30 or higher and water resistant. 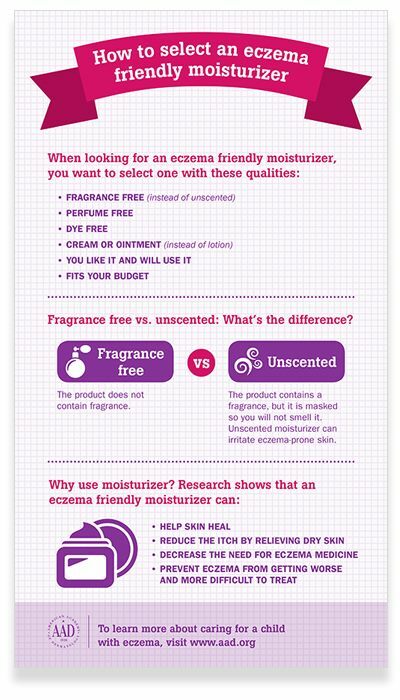 Infographic on how to select an eczema-friendly moisturizer, courtesy of the American Academy of Dermatology. Acacia Dermatology & Dr. Robert Chen participated in Healthy Tennessee's 2017 Lawrenceburg Health Screening. He will be providing free skin cancer screening as a part of American Academy of Dermatology's Spot Skin Cancer initiative. It's easy to keep your skin well-hydrated with these tips. One of the most common reasons people come to see us at Acacia Dermatology is because of dry or sensitive skin. Dry skin can be unsightly and folks with dry skin can be prone to irritation and itchiness, especially when the weather is dry or (paradoxically) when it's hot and humid. If you have dry skin, the first thing to do is make sure you moisturize every day, especially after showering or bathing. If you find moisturizing lotions to be inadequate, that is because lotions are fairly "thin" and do not do a good job at sealing your skin to prevent moisture loss. In this case you can do better by switching your lotion product to a cream product, one that is thicker, and do a much better job at sealing in the moisture within your skin. There are many effective moisturizing cream products in the market, such as those from Eucerin, Aveeno, Vanicream, CeraVe, and others. I highly recommend Cetaphil Moisturizing Cream. It's the product I use daily for me and my family. Go to www.cetaphil.com/offers for a $1 off in-store coupon if you are interested in trying out this great product. Skin care blog by Robert L. Chen, MD, PhD, for Acacia Dermatology & Laser Center (Copyright © 2017). Do you or someone you know suffer from Psoriasis? Xtrac laser therapy is used to treat psoriasis and vitiligo, as well as some forms of eczema. It is a targeted laser (specific light source with one wavelength) that we use to treat individual spots and areas to clear up these conditions. The laser is focused on the patches of skin that are involved and over time the patches improve. Usually the procedure lasts about 10-20 minutes, is not painful, and is covered by most insurance plans. Our staff is trained and experienced with this laser and we have flexible appointments to best serve your needs. How do I know if I need XTRAC? Any patient with mild to moderate psoriasis will benefit from this treatment. This can include patients that have failed topical or systemic medications, or have not been able to achieve total control of their psoriasis with these therapies. Even patients on biologic medications can achieve better control with this laser therapy by clearing those stubborn plaques of psoriasis that don't completely resolve with these drugs. There is also no pain during the treatment and children will tolerate it well. Developed by PhotoMedex, the XTRAC Velocity excimer laser offers new hope to individuals suffering from psoriasis, vitiligo, and other skin conditions. Introduced in 2000, the XTRAC is the first FDA market-cleared excimer laser system for the treatment of psoriasis. It is also cleared for treatment of vitiligo and atopic dermatitis. These treatments will not work the same for everyone and may or may not give the same effect that XTRAC Velocity laser provides. The XTRAC Velocity excimer laser delivers a more controlled dose of UVB light only to the plaques of psoriasis. Traditional UVB therapy treats the entire body surface area, takes more treatments and requires much longer treatments to achieve clearance of psoriasis plaques. Some patients need to be in a light box as long as 30 minutes at a time while the XTRAC Velocity takes less than ten minutes for a treatment. We can also treat the scalp with this laser, but traditional light therapy is unable to penetrate into the scalp. Scalp psoriasis can be a very stubborn condition to treat and often requires multiple, messy topical medications which don't necessarily work for everyone. What is the cost of XTRAC Velocity Excimer Laser? Laser hair removal is one of the most common cosmetic procedures performed in the US. Despite its popularity, the treatment may be intimidating to some. We answer a few of the most frequently asked questions to demystify this popular procedure. A: Each pulse of the laser focuses highly concentrated light beam at the root of the hair follicle. The follicles are destroyed without damaging the surrounding skin. Q: Is laser hair removal safe? What areas can be treated? A: Laser hair removal is safe for treating almost any area of the body including the face, arms, underarms, bikini line and legs. At Acacia Dermatology, Dr. Chen and his staff carefully treat their patients with the Cutera Coolglide laser, safe and effective for both men and women. Q: How long does each treatment session take? A: Each pulse of the laser takes less than a second. Therefore, small areas like the upper lip take only several minutes to treat while larger areas such as the back or legs will take proportionately longer. Q: How many treatments do I need to get rid of unwanted hair? A: 4 to 6 treatments are usually required. The treatments can be performed approximately every month until the hair stops growing. Annual maintenance treatments may be needed to ensure long-lasting results. A: The cost of the procedure as well as the amount of sessions needed to remove unwanted hair depends on the size of the area on the body, the color and thickness of the hair, and the skin type and color of the patient. Sessions are priced individually and customized to your needs. Be sure to ask about our discounted treatment packages. Q: Are the treatments painful? How will I feel afterwards? A: You can expect to feel minimal pain during the procedure. There are usually little to no side effects afterwards. Since the treatment is so quick and no downtime is usually expected, you can go about your normal activities directly following the procedure. The above blog entry is written by Robert L. Chen, MD, PhD, for Acacia Dermatology & Laser Center (Copyright © 2016). Ladies it's that time of year to start showing off those legs again! Let us get rid of those unsightly veins for you! Starting now through April , our vein treatments will be 20% off! Call us today at 931-201-9018 to get started! Dr. Robert Chen of Acacia Dermatology was interviewed in an article titled "Skin cancer still deadly problem: Education remains key to prevent one of nation’s overlooked killers," published in the May 10, 2014 edition of the Florence newspaper, the TimesDaily. Many thanks to Tom Smith, Senior Staff Writer of Florence TimesDaily, for working hard to bring sun safety and skin cancer awareness to the forefront of the Shoals and Lawrence County Communities.